The SVR Pro Series is a lightweight, ultra-reliable precision voltage regulator. Features include: 31 lbs; wide input voltage range while maintaining output voltage regulation of +2%; UL listed operating temperature from -20°C to 55° C; eliminates generator frequency shifts. Acts as a firewall between dirty utility power and your equipment. 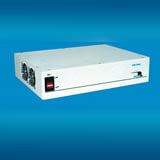 UL listed to operate from -30°C to 65°C, the SVR-PL Series is designed for industrial and high temperature environments. Features includes: 31 lbs; wide input voltage range with +2% output voltage regulation; eliminates generator frequency shifts. Optional high temperature batteries available. Frequency converter capability.